And that is the clincher. On the path to getting our “reward,” we set ourselves up to be discounted long before our time. People report experiencing ageism as early as 50—an age when one is just beginning to enter the full bloom of professional expertise. How did this happen? It was not always this way. When America was primarily an agricultural society, one simply moved from more demanding physical jobs to lighter jobs. But the distinction was physical, not mental. As long as one kept up with the times, “older” meant wiser, more experienced, and—you might be surprised at this one—respected. We propose that everyone should deliberately avoid using the word “retirement.” Instead, let’s change our idea of the work environment to support more flexibility for everyone-young and old. Let’s explore ways that we can open up our attitudes to support people in the pursuit of their chosen purpose. Purpose is not just a job, it encompasses much more. Let’s encourage a national discussion on the very real issues of poverty and medical needs without linking them to age. We propose using the words “Act Three” as the time when we have mastered the essentials of family, relationships, and work. Those ages associated with the second half of our life should be associated with fulfillment, purpose, joy and loved ones. It is not the end, it is the beginning of the best part of our lives. 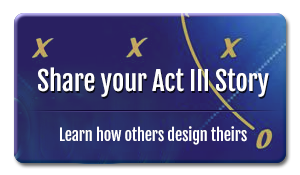 Why Do We Need to Prepare for Act III? Why Did We Write This Book?